Anyone longing to thrive as a highly sensitive person should read this warm, supportive book. 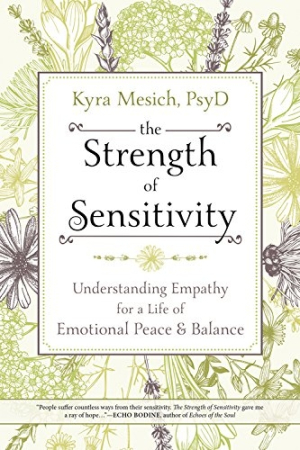 Kyra Mesich’s The Strength of Sensitivity is a go-to volume for those moving through life feeling strained by the intensity of their various sensitivities. Mesich covers a range of these, including sensitivity to sounds, foods, toxins, sensations, and emotions, all while continually affirming how important these heightened perceptions are to an individual’s ability to enjoy a full life. Mesich describes highly sensitive people as those who are aware of even the slightest influences in their physical and emotional environments. Sensitive people feel such influences strongly, and they tend to react in kind, quite often to the detriment of their own happiness and well-being. With a friendly, personable tone, Mesich works to reframe the often negative traits commonly associated with being “too sensitive.” This negativity, Mesich asserts, gets internalized by highly sensitive people and contributes significantly to the struggles they face. Mesich suggests, instead, that highly sensitive people view themselves as “highly perceptive,” and that traits such as deep feelings, strong reactions, active nervous systems, and enhanced empathy be seen as strengths rather than weaknesses. Of special note is Mesich’s discussion of what she terms “Never-Ending Sensitivity Syndrome,” the frustrating condition in which a sensitive person continually develops new or enhanced environmental and food sensitivities. With a firm grounding in the connectedness of the body, mind, and spirit, Mesich offers new advice—and new hope—for those on the seemingly ceaseless path of “healing the gut.” There’s much more to it, Mesich contends, than just digestion. Being peaceful and happy as a highly sensitive person, then, is shown to have much to do with changing one’s own perspective. Mesich offers, along with her guidance, which incorporates a plethora of valuable methods and tools to assist in this paradigm-shifting process. The benefits of flower-essence therapy are explored, as are the importance of mindfulness and meditation. Mesich also includes a number of rich guided meditations and writing exercises geared specifically toward seeing sensitivity, empathy, and intuition in a new light. Additional resources are listed at the volume’s close.